We had a guest speaker at church today. It was his very first sermon and let me tell you, he nailed it. He brought a tear to many an eye in our sanctuary this morning. There was a real sense of holiness and power during his very short message. I know I’ll never forget it. PB had just finished serving everyone communion. 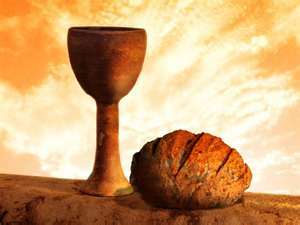 At our church people come forward, take a small piece of bread and dip it in the cup of grape juice. They may pause at the altar or go back to their pew for some quiet moments. When everyone has come forward, PB takes the elements to people who had not been able to walk up the aisle. Then he returns to the front of the church and puts the bread and cup on the altar, covering them with a white cloth. It was at that moment when Jon came sprinting up the aisle, climbed the steps, hurried to PB and tugged on his suitcoat. “Pastor?” he asked expectantly. My dear husband turned around to see an eager little boy hoping he was not too late for this special event. Getting down on one knee, PB let Jon take a piece of bread and dip it in the juice. The little guy put it in his mouth with great satisfaction. “Remember Jon, Jesus loves you.” The small blond head nodded. Then he ran back down the aisle and it was over. But oh, what a hushed and holy moment. I am not interested in a debate about the pros and cons of offering children communion. I just know that I wish I had run down the aisle with such abandon. If only we were all as desperately eager to be included in the holy sacrament. Oh, to be equally satisfied with the chance to taste of the goodness of God. PB wiped his eyes and folded up his sermon. No need for another message today. Thank you Jon. God is good. All the time. This entry was posted in Devo Drops and tagged communion, message, sermon. Bookmark the permalink. Such a simple yet profound moment. I am so grateful that I had a front row seat today for our sweet little pastor’s first sermon. It is one that I will never forgot. Now, you see one reason why Little Mister has not yet arrived. If you you and Bake had not been in church, this event would not likely have happened, or at least would not have unfolded in the manner it did……and the moment/message would not have been shared through your blog with so many more than those who witnessed it! Oh my goodness. I had not even thought of that. What an insight. So the fact that I’m still here today means I had better keep my eyes open to what’s going on TODAY, too. Fred said, “Oh, I wish I could have seen that!” So do I.
I COULD HARDLY BELIEVE WHAT I WAS SEEING. THE TEARS JUST KEPT COMING THROUGHOUT THE DAY. BLAKE WAS SO TENDER AND LOVING AND THE LITTLE GUY SO WAS SINCERE. IT WAS A SERMON IN A NUTSHELL.